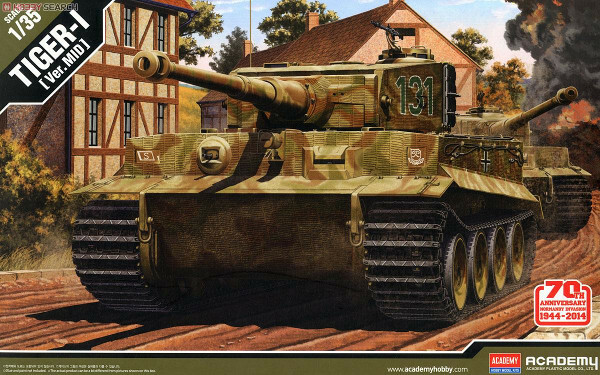 The Tiger I is probably the most famous and feared tank of the Second World War. It was designed as a "breakthrough" weapon with thick armor and an 88mm cannon. For over 2 years there wasn't a single Allied tank able to match it on the battlefield. Its dimensions were impressive: it was over 27 feet long, more than 12 feet wide, and it weighed over 50 tons. The hull and superstructure armor were 100mm thick, the hull sides were 60mm thick and the superstructure sides and rear plate were 80mm thick. The Tiger I tank used interleaved road wheels on an overlapping torsion bar suspension, in order to achieve the proper ground pressure. A five man crew operated each Tiger I.
Henschel und Sohn of Kassel built 1,354 Tiger I tanks during its two year production run from July 1942 to August 1944. Maybach provided the 650 hp HL 210 P45 V-12 gasoline engine. The more powerful 700 hp HL 230 P45 motor replaced the HL 210 at the end of the 1943. The Tiger I was subject to continuous running changes to components such as its turret, mantlet, commander's cupola, crew hatches, etc. which led to variant designations such as "Early," "Mid" and "Late." 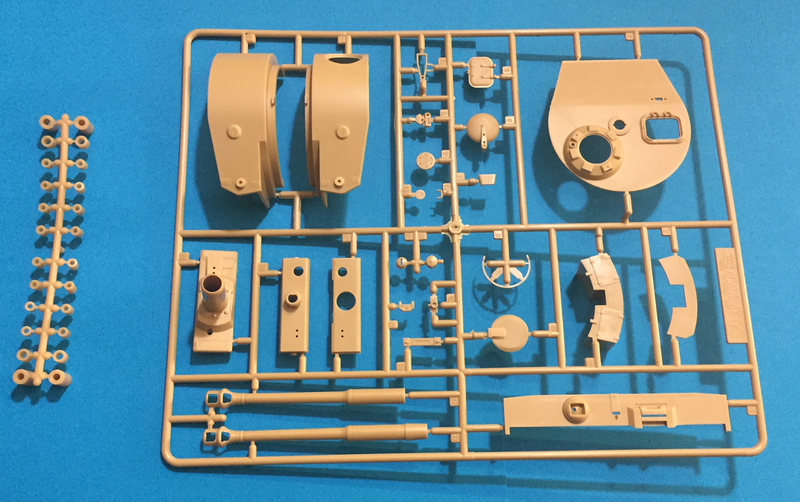 It's very important to have access to photographs of the tank you wish to model, when available, in order to confirm the detail differences from one tank to another. 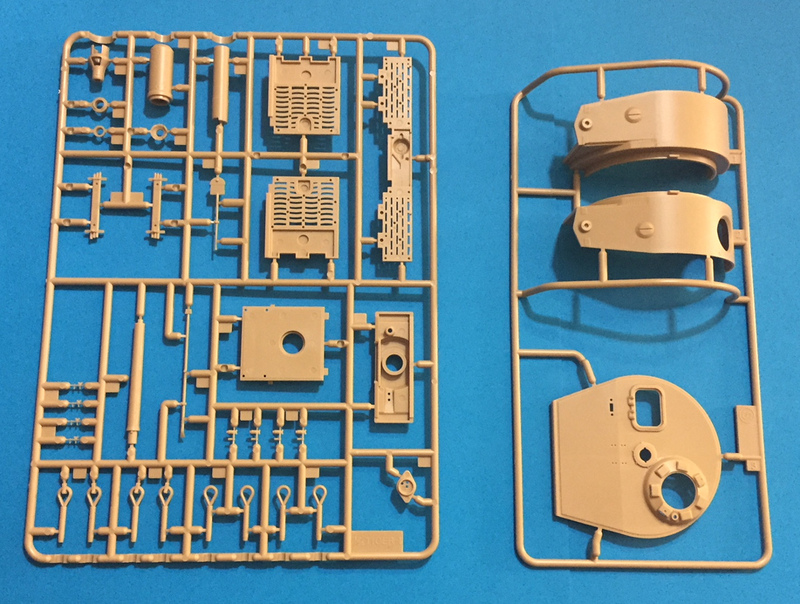 The kit depicts a Tiger I with Zimmerit (anti-magnetic mine paste applied to the superstructure and turret) and rubber tired road wheels. It consists of 469 parts. 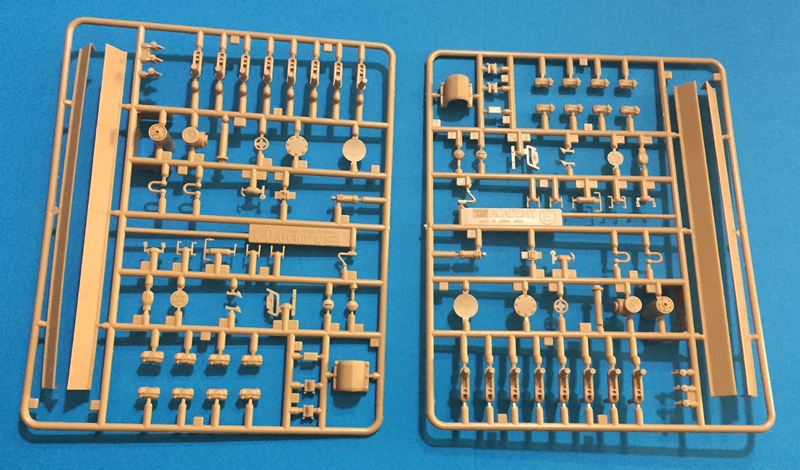 410 of these are injection molded plastic on 11 sprues, plus the hull. 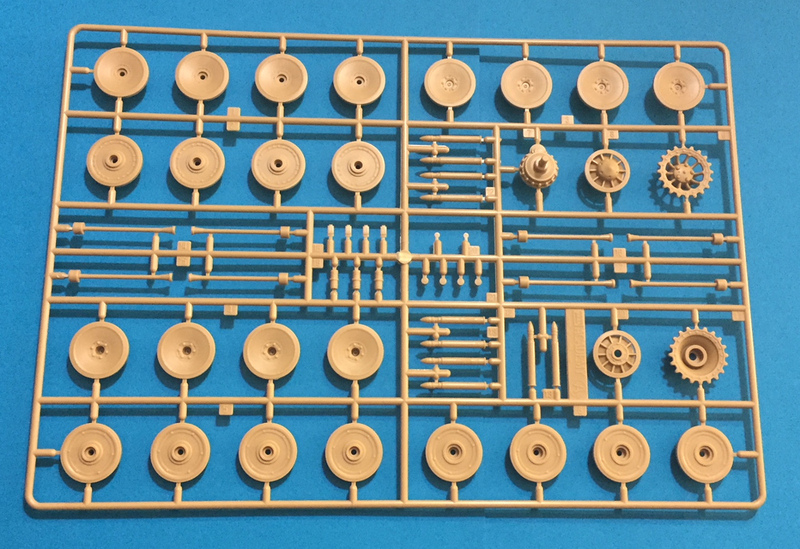 You also get 2 "rubber band" style tracks, 24 poly caps, a photo-etch fret containing approximately 7 parts and a decal sheet. 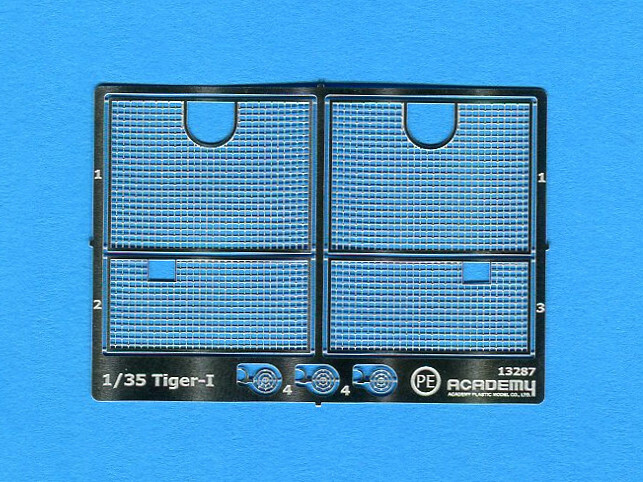 67 of the plastic parts are surplus to this particular Tiger boxing and are destined for your spares box. 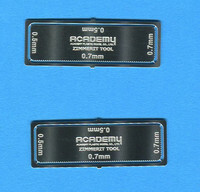 The PE fret includes a tool for making your own Zimmerit, unlike the previous Academy Tiger I reviewed. 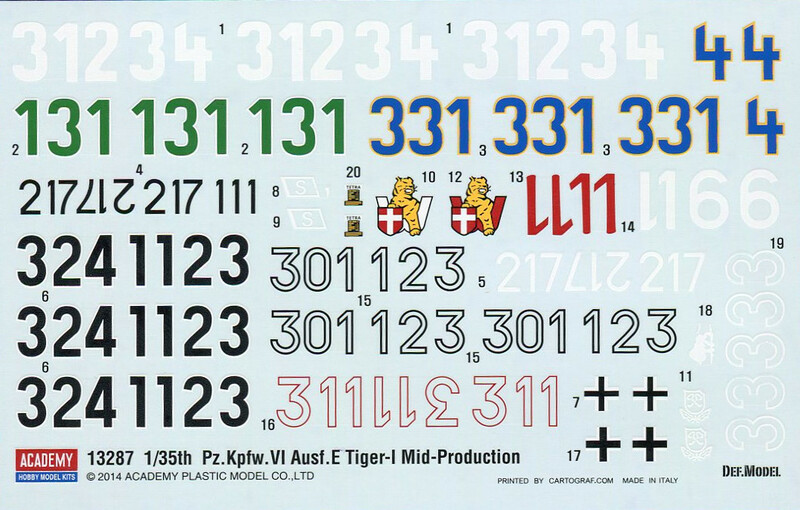 That kit included Zimmerit in the form of a decal sheet. My initial impressions of the kit are positive. The contents of the box are impressive. 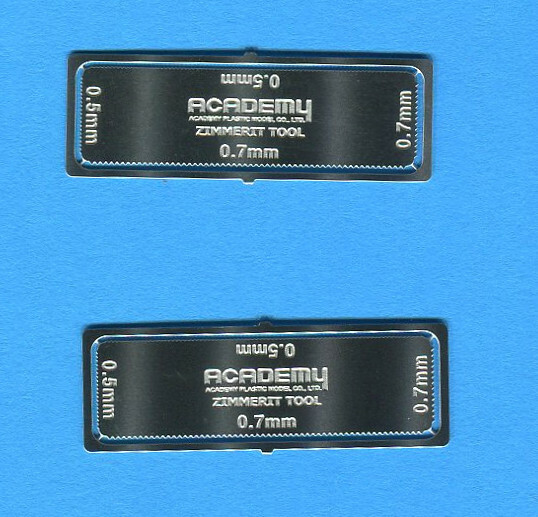 I really like the fact that Academy now provides you a single piece gun barrel. Otherwise I would have recommended an aftermarket turned metal barrel. The hull is well molded and detailed. There are pins molded on the hull, in front of each torsion arm mount, that locate each suspension arm in a fixed position. These pins correspond to holes on the inside of each suspension arm, which provide for a level suspension. If you bypass the pins you can articulate the suspension to depict your Tiger advancing over uneven ground. This is a nice feature and I appreciate Academy's thoughtful approach. The interleaved road wheels, drive sprockets and idlers are well executed. The tracks are the old, one-piece vinyl tracks that many manufacturers have abandoned for more accurate, individual link tracks. When I say more accurate, I mean that individual link tracks not only have greater detail, but they also "sag" over wheels and sprockets in a more realistic manner. 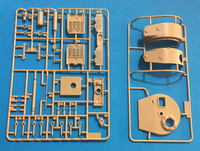 The vinyl tracks are well detailed, and they are certainly adequate for modelers who are intimidated at the prospect of building individual link tracks. There are a fair number of parts to add to the hull. These include the fenders and exhausts shields Take your time with this task. The rear end of the Tiger was covered with lots of fascinating parts and Academy provides the items to accurately depict this area. The hull upper structure is nicely detailed. The rear upper hull is very well rendered and in conjunction with the PE ventilation screens, it looks very accurate. Virtually every item attached to the upper hull superstructure, including the towing cables, is an individual item to be attached, one by one. I associate molded-on "detail bits" with smaller scale armor and I think this is a positive development. The turret is well molded and it includes spare track links and stowage bins. "Green 131," SS sPz, Abt. 101, 1st Company, Normandy, France, July 1944. Gruppe Fehrmann, Essel, Germany 1945. This Tiger was Sandy Yellow overall with Dark Green and Red Brown splotches. "Blue 331," SS sPz, Abt. 101, 3rd Company, Amiens, France, May 1944. Gruppe Fehrmann, Achum, Germany 1945. This tank was Sandy Yellow with wide bands of Dark Green and Red Brown. "White 312," SS sPz, Abt. 101, 3rd Company, Mons, Belgium, Winter 1943-1944. Sandy Yellow with wide bands of Dark Green and Red Brown. "Black 311," sPZ, Abt. 501, Eastern Front, April 1944. This tank was Sandy Yellow with a pattern of Dark Green bands. "White 217," Otto Carius, sPz, Abt. 502, Battle of Malinava, Latvia, July 1944. This tank was also Sandy Yellow with a pattern of Dark Green bands. "Black 217," sPz, Abt. 502, Battle of Narva, Estonia, Early 1944. Dirty white distemper paint over Sandy Yellow. "White 1 or White 6," sPz, Abt. 506, Ukraine, April 1944. This tank was Sandy Yellow with irregular bands of Red Brown. "Red 11," sPz, Abt. 506, Ukraine, Winter 1943-44. White winter distemper over Sandy Yellow with irregular bands of Red Brown.
" Black 213/301/311/321," sPz, Abt. 501, Eastern Front, March 1944. White winter distemper over Sandy Yellow with irregular bands of Dark Green. "White 3," sPz, Abt. 508, near Rome, Italy, February 1944. This tank was Sandy Yellow with irregular bands of Red Brown and Dark Green. I think this is a very nice kit. It is reasonably accurate, it certainly looks the part, and the construction promises to be free of drama. I would recommend individual link tracks, if that is your "thing." You can certainly make do with the kit tracks, and save significant time, but link tracks are simply better. I would also replace the kit tow cables with aftermarket parts. You can also buy a turned metal gun barrel but the kit gun is pretty good. The markings options are also very interesting and the kit's packaging, presentation and completeness are first class. I feel that one can produce a nice mid version Tiger I right from the box, and an absolutely stunning one with a little aftermarket help. 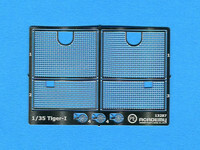 I recommend this kit and I would like to thank Model Rectifier Corporation for the review sample.